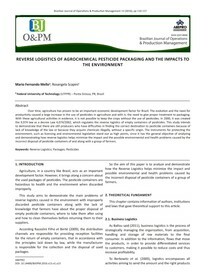 productivity caused a large increase in the use of pesticides in agriculture and with it, the need to give proper treatment to packaging. incorrect disposal of pesticide containers of and along with a group of farmers. and laws that gave theoretical support to this article. point of consumption to meet the clients\u2019 requirements. costs, there is a limit, and this is the third point of emphasis. store device to facilitate the flow of producers. something vital to corporate strategy. to its important role in the recent decades, for Leite (2009). other environmentally disposal. (Brazil, 2010). consumption or use, for repair, reprocessing or disposal. for others, the Decline is the most time consuming phase.